Is the clamp mount more stable than the freestanding mount? Both mounts are very stable and whichever one you choose to use depends on the parameters of your current desktop setup. We recommend using the clamp mount because it does allow you to bring the keyboard tray below the level of your desktop. So in that sense, the clamp mount is more stable. But if you go with the freestanding mount, your Standing Desk Converter will be very stable as long as you keep your keyboard tray above the horizontal plane of the desktop. Almost! Just attach the keyboard tray to your Standing Desk Converter and you will be standing in no time! Can I put monitor arms on this? No, the Standing Desk Converter does not support monitor arms. If you would like a desktop converter that will allow a monitor arm to be attached check out the Standing Desk Converter. Does the "freestanding" version of the Standing Desk Converter connect to the desk at all? No, the Standing Desk Converter Riser just sits on top of your desktop. This makes setup a breeze and also allows you to easily move the Standing Desk Converter Clamp. When the Standing Desk Converter Riser is lowered the keyboard tray will sit at desktop level. When the Standing Desk Converter Clamp is lowered the keyboard tray will hang 3.2" below the horizontal plane of the desk. Is the keyboard tray palm rest removable? Yes, the keyboard tray palm rest can be removed using an Allen wrench. What is the advantage to getting the Standing Desk Converter vs the Adapt X? Both desktop converters are pneumatic, but the Standing Desk Converter moves in a swinging motion compared to the up-down motion of the Adapt X. The clamp mount on the Standing Desk Converter also has a smaller footprint than the Adapt X. If you want your keyboard tray to go lower than the level of your desk, then you must order the clamp mount. I have a shallow desk, will the Standing Desk Converter still work? If your desktop is shallower than 23.5" then you must use the Standing Desk Converter Clamp. Otherwise you will not have room on your desktop to support the freestanding base. Is the keyboard tray adjustable on the UPLIFT Standing Desk Converter? The keyboard tray will not adjust separately from the Standing Desk Converter. It will only move up and down at a fixed position in combination with your desktop converter. We recommend going with the Clamp because it will allow your keyboard tray to rest lower than the surface of your desktop when the converter is at its lowest position. This will offer you a better ergonomic setup while you are seated at your desk. How does the Standing Desk Converter lock in place? Once you move your Standing Desk Converter to the desired height, just release the paddle and your desktop converter will lock in place. 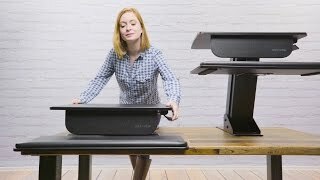 Will the weight of the items I place on top of the Standing Desk Converter affect how quickly it moves? There is a tension control adjustment on the back of the Standing Desk Converter. To adjust the tension to the weight of your desktop items, turn the large Allen wrench clockwise or counterclockwise. My monitor is pretty heavy, will the Standing Desk Converter support it? As long as your monitor and everything else you place on your desktop weighs no more than 28.6 lb, the Standing Desk Converter will be able to safely do its job. Choose either a freestanding or clamp mount. The freestanding mount lets you place the system anywhere on your desktop, but the keyboard tray will sit on top of the desk and will not go lower than the desktop. The freestanding mount requires 23.5" minimum depth for installation. The clamp mount requires that you clamp the system to the back edge of your desktop. This allows the attached keyboard tray to adjust lower below your desk surface for a more ergonomically correct typing position for sitting and standing. We highly recommend the clamp mount option unless your desk setup requires the freestanding mount. The clamp mount requires 19" minimum depth for installation. Our 18" x 30" Standing Desk Mat boasts a gel foam core, providing steadfast support while you're standing at your UPLIFT Desk. Lightweight and unassuming, you can stow the mat away when it's not needed, saving space at your workstation.